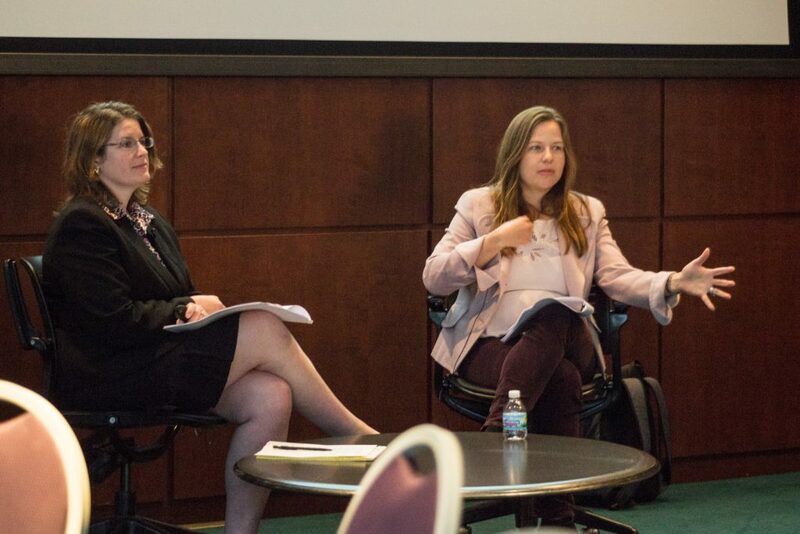 Last week Professor Robbins, head of our Praxis Certificate program, hosted a workshop with Jenny Johnson Ware on the value of learning to listen effectively and the long-term career value in developing on this skill, especially for young attorneys. Listening matters well beyond the legal profession, of course – you may find some of these tips helpful with approaching big family holiday dinners too! 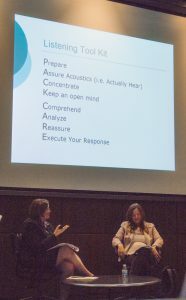 The workshop also included an excellent handout of resources on listening for lawyers, which I have incorporated into the links throughout this post. For each point, they provided practical examples and stories of how to use (or not use!) each skill for the best outcomes in a legal career. Preparation can help or hurt – you want to still be able to focus on listening, not just responding with the next point you have in mind. In a pro-bono case with a client who had been identified by the victim, Ms. Johnson Ware had several strategies prepared when it came time to question the victim of the crime on the witness stand. By listening to their statements carefully, she realized she couldn’t use a sympathy strategy based on uncertainty. Instead, she needed to capitalize on the witness’s confidence and tendency to answer questions based on looking at her client. Knowing her client had a very different hair style in court than they’d had when they were picked up by the police, she was able to ask questions that proved the witness was willing to pin everything on her client without an accurate description. If she hadn’t prepared different strategies for questioning, she might have asked the wrong questions and reinforced inaccuracies rather than clearing her client of all charges. What not to do: When working with a witness, both workshop speakers said focusing on a specific script and practicing too much in advance could make it difficult to hear when they vary from the planned content, for example. But preparing by focusing on key points rather than a script can help both lawyer and client stay focused. What to do: When preparing to anticipate an opposing counsel’s points, Ms. Johnson Ware described researching issues in advance but separating them into different sheets so she could reorganize her response or remove points that turned out to not to apply to their argument. Example: Ms. Johnson Ware described a situation in a courtroom where her client wasn’t answering the opposing counsel’s questions in a way that made sense to her. 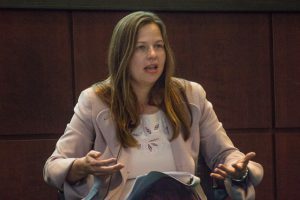 She realized her client was having a hard time hearing the opposing counsel’s questions and was trying to cover up that difficulty, and didn’t want that limitation to affect the outcome of the case. So she made sure to go to the judge and arrange for more sound equipment to be brought in to mitigate the problem her client was experiencing. How often have you started a conversation with someone and realized you’ve already lost the name of the person you’re talking to by the end of the introductions? All the preparation in the world won’t help you listen effectively if your mind wanders at a key moment. This week our Praxis Certificate program hosted an effective listening workshop – here’s the introduction to get it started, you can learn more in the recap on our blog! Being aware of bias – all kinds of bias – is key to effective listening because you want to make sure you aren’t allowing inaccurate assumptions to distort what you hear. While we may assume something like discrimination when we hear the word bias, it applies to many other types of assumptions as well: confirmation bias, anchoring bias, and more. Example: In an international business case, two executives – one from the U.S. and one from Japan, were going through financial details, both assuming that the tax laws for both countries would work with the same factors. When the issue was brought up explicitly in a question, they realized that assumption could have had massive financial consequences if they hadn’t adjusted for the different international laws. Confirming what you’ve heard and asking follow up questions can be a key professional listening skill, especially early in your career. Both speakers agreed this is a very common problem for young associates or interns: when given an assignment they don’t always confirm that they’ve understood what’s expected or checked to make sure their assumptions are correct. Misunderstandings with assignments can create a lot more confusion and frustration later if they aren’t clarified right away. Ms. Johnson Ware noted that timing can be tricky when it comes to analysis. She said when working with clients, she prefers to confirm that she’s understood the information they’re giving her, then tell them she’d like a specific amount of time to go over it and get back to them with a response. In a courtroom, though, there is likely not going to be the same kind of time available to respond. Ms. Johnson Ware described her personal strategy: when listening to opposing counsel’s questions or statements, she takes careful notes on one half of the page, while noting the points she wants to respond to on the other half, leaving space to add arrows or other notations about the order she wants to use. Organizing her notes as she listens this way allows her to start crafting her response much more quickly. This skill may rely on non-verbal responses and can become habitual – which both speakers noted could be a problem in some cases! What not to do: Be aware of your tendency to give reassuring responses like nodding, smiling, responding with “Ok” or “Thank You” – in examining a witness in court, for example, it may be important to keep them off-balance and you wouldn’t want your body language to undermine your questioning strategy. What to do: When discussing a case with a client, pay attention to their client’s fears. Ms. Johnson Ware said this is important for gaining clients that are considering multiple attorneys. If they’ve built up a specific worst-case scenario that you can tell isn’t accurate, giving them relief over that issue during a discussion will make them much more likely to want to work with you. On the other hand, if it’s clear that a potential client has misgivings about hiring you based on anything in your skillset or experience, you want to address that clearly so they can make the best judgement. This last point may not seem as much like a listening skill, since it sounds more like talking. It’s important to not forget to listen and to observe how they respond to what you’re saying, including body language. Many “Active Listening” responses are also important for the “CARE” listening skills – response strategies can include summarizing, paraphrasing, follow-up questions, and open-ended questions. Interested in more Praxis Workshops? The Praxis program supports Chicago-Kent students who want to capitalize on the robust legal skills offerings in our curriculum and develop the core competencies required of successful lawyers. You can learn more about the Praxis Certificate, which won the Illinois SBA’s first Excellence in Legal Education Award on their program requirements page. If you’re interested in joining, submit your information through this Enrollment form. 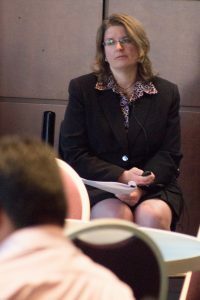 This entry was posted in Chicago-Kent, Legal and tagged lawyering, workshops. Bookmark the permalink.